It may not be a Tesla, but this electric car was the height of cool when it graced newspaper comics pages around the world in 1959. Detroit-based commercial illustrator Arthur Radebaugh had plenty of practice dreaming up cars of the future. 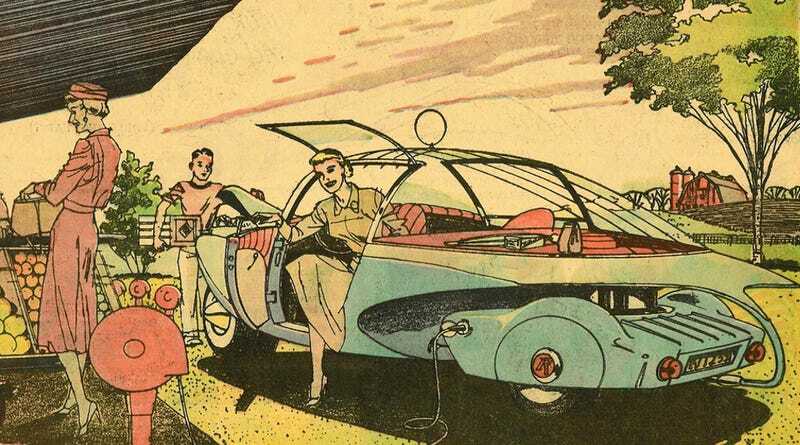 Many of Radebaugh's clients were Detroit automakers who loved his futuristic flair, which was used to promote sometimes outlandish ideas about how people would get around in the world of tomorrow. Among them was this little blue car from the March 29, 1959 edition of Radebaugh's Sunday comic called "Closer Than We Think" (1958-63). With its transparent bubble-top, dramatic curves and electric plug-in (not to mention those retro-licious white-walled tires), this was the automobile of the future. Radebaugh's strip imagined the car not as a long-distance traveler, but as kind of thing you'd zip around town in for quick trips to the supermarket or maybe the theater, catching one of those hot new 3D movies. The electric car was far from new in 1959. In fact, a quarter of registered cars built in the U.S. at the turn of the 20th century were electric. But after gasoline engines established dominance in the 20th century, even the most conservative prognosticators were certain that gas wouldn't be dominant forever. The first half of the 20th century had seen tremendous change in how people got around, with everything from highways to air travel becoming mainstream realities in the United States. So why wouldn't transportation continue to evolve in the latter half? In an age of techno-utopian thinking—when "why not?" was as good an answer as any for futurists who imagined vacations on the moon and robot butlers—the electric runabout of the future was a done deal. They worked just fine in major cities before. It was only a matter of time before they made their triumphant return. Radebaugh and others promised that 21st century would be filled with cheap, easy and fun electric cars. The last five decades may have dampened the spirits of so many electric car boosters longing for this retrofuture to become a reality. But with the likes of Tesla and others making such huge strides in the electric car market here in the 2010s, this vision of tomorrow may indeed be closer than we think.